Expression and identification of putative Cry proteins of the entomopathogenic bacterium Bacillus thuringiensis israelensis (Bti) have been documented during 24, 48, 72 and 96 h of bacterial culture both at 30 and 37°C. Putative Cry11A and CytA, Cry4B and Cry4A have been recorded to be early, mid and late expressing proteins, respectively. No difference on the level of expression of Cry proteins has been observed between 30 and 37°C. The mosquitocidal proteins were found to be very thermo labile and crude proteins are effective against Aedes aegypti larvae than partial purification. These studies showed that both Cry4B and Cry4A are very unstable even at 40°C and therefore synergistic interactions among the Cry proteins with that of CytA which is required for high toxicity is probably hampered. These factors probably responsible for the total loss of mosquitocidal efficacy of the heat-treated partially purified proteins of Bti. Heat-treated proteins were found to loose the mosquitocidal efficacy against the larvae of Aedes aegypti mosquito. Kazi Asraful Alam, Shakil Ahmed Khan, Kajla Seheli, Md. Nazmul Huda, Md. Abdul Wadud, Md. Salim Hossain Reza, Md. Eunus Ali, Chanchal Mandal and Md. Abdus Salam, 2008. Mosquitocidal Activity of Bti Producing Cry Protein Against Aedes aegypti Mosquito. Research Journal of Environmental Sciences, 2: 46-51. Bacillus thuringiensis (Bti) is a gram-positive soil bacterium having genome size of 2.4 to 5.7 million base pairs. The prevalence of this strain is not restricted to soil but has been isolated worldwide from many types of habitats (Schnepf et al., 1998). Many entomopathogenic bacteria have been identified from the genus Bacillus. Bacillus thuringiensis forms parasporal crystals during the stationary phase of its growth cycle. These crystals are specifically toxic to certain orders and species of insects, like Lepidoptera, Diptera and Coleoptera. Many different strains of Bt have been shown to produce these inclusions of Insecticidal Crystal Protein (ICP). During sporulation, it synthesizes a cytoplasmic inclusion containing one or more proteins that are toxic to insect larvae. Upon completion of sporulation the parent bacterium lyses to release the spore and the inclusion. In these inclusions, the toxins exist as inactive protoxins. Ingestion of the inclusions by insect larvae initiates proteolytic cleavage at high alkaline pH by larval protease. This proteolytic cleavage results the release of active insecticidal proteins from the inactive protoxins (Schnepf et al., 1998). It has been reported that the activated toxin binds to insect-specific receptors exposed on the surface of the plasma membrane of midgut epithelial cells and then inserts into the membrane to create transmembrane pores that cause cell swelling and lysis which cause death of the insect (Schnepf et al., 1998). Various subspecies of Bacillus thuringiensis (Bt) are distinct by producing insect larvicidal proteins (δ-endotoxins) aggregated in parasporal crystalline bodies. The high potencies and specificities of these Insecticidal Crystal Proteins (ICP) have spurred their use as natural pest control agents in agriculture, forestry and human health. On the basis of insecticidal and molecular properties, four major classes of δ-endotoxins (CryI, -II, -III and -IV) and cytolysins (Cyt) found in the crystals of the mosquitocidal strains (Schnepf et al., 1998). Biopesticides based on the bacterium Bacillus thuringiensis currently are being considered as safe alternatives to chemical insecticides. Toxins of this bacterium are environmentally welcoming because they kill only those insects susceptible to the toxins, whereas current synthetic chemical pesticides indiscriminately kill pest and beneficial insects alike and are considered to be major toxic pollutants of the environment (Höfte and Whitely, 1989). B. thuringiensis has been used successfully in forestry and agriculture, both as spray formulations and as systemic pesticides expressed in plants and high level of target specificity makes B. thuringiensis a more desirable choice than broadspectrum chemical insecticides (Van Frankenhuyzen, 1993). B. thuringiensis subsp. israelensis has also been used successfully in control of mosquito vectors. It expresses several genes and has broad control over most important mosquitoes but lacks good persistence in the field (Becker and Margalit, 1993). It has been reported that the mosquitocidal activity of B. thuringiensis subsp. israelensis results from the synergistic action of four major proteins, of 125, 135, 68 and 27 kDa (Crickmore et al., 1995; Poncet et al., 1994), which are now referred to as Cry4Aa1, Cry4Ba1, Cry11Aa1 and Cyt1Aa1, respectively (Crickmore et al., 1998). Mosquito and black fly populations, which transmit diseases such as malaria, filariasis and onchocerciasis, have primarily been controlled with chemical pesticides. The emergence of resistant insect populations has led to increased interest in biological control, including utilization of naturally occurring entopathogenic bacterial strains. Two bacterial strains, Bacillus thuringiensis subsp. israelensis and Bacillus sphaericus, have been used safely and efficiently to control black flies and Culex larvae, respectively (Priest, 1992; Porter et al., 1993; Porter, 1996). Due to the high specificity for these unique receptors on the membrane of the gut epithelial cells, these toxins (delta-endotoxins) are harmless to non-target insects and the end-user and are compatible with integrated pest management programs. Nevertheless, the production cost of biopesticide from these strains limits its use in developed nations only. Therefore, studies on the expression and characterization of individual mosquitocidal Cry proteins could be a useful tool to develop a protocol for cheaper production of mosquitocidal biopesticide from the Bacillus thuringiensis israelensis. This study was conducted in 2005 and 2006 with the collaboration of Insect Biotechnology Division. The selected strain of Bacillus used throughout the experiment was Bacillus thuringiensis subsp. israelensis. This strain belongs to serovar H-14. A pre culture of 10 mL was inoculated into fresh culture for 24, 48, 72 and 96 h both at 37 and 30°C in a shaking water bath. After each time interval, the culture was removed from the water bath. The cells were collected by centrifugation at 10,000 rpm for 10 min at 4°C using a refrigerated centrifuge machine. The harvested cells obtained by centrifugation were washed once with phosphate buffer, pH 7.2. The harvested and washed bacterial cells were sonicated by ultrasonic generator, Model US-50, at 10 sec pulse up to 10 min until a clear suspension was obtained. Polyacrylamide gels are composed of chains of polymerized acryl amide (CH2 = CH-CO-NH2) that are cross-linked usually by N, �-methylene bis acrylamide (CH2 = CH-CO-NH- CH2-NH-CO-CH = CH2). Ammonium persulfate or riboflavin initiates the polymerization and N, N, �, �-tetramethylene-diamine (TEMED) accelerates the rate of polymerization (Sambrook et al., 1989). About 4.2 mL of 30% acrylamide: bisacrylamide (29:1) was mixed with 2.5 mL of 4 x gel buffer and 16 μL of ammonium persulfate. Volume was adjusted to 10 mL with distilled water. Finally 10 μL of TEMED was added for polymerization. The gel was then poured into the prepared plates. Sample position forming comb was inserted and then gel was allowed to polymerize for half an hour at room temperature. One hundred microgram of each sample was taken, mixed with equal volume of 2 x gel loading buffer and heated at 100°C for three minutes and loaded on gel. The molecular weight marker was included in one lane. Gel was allowed to run at 120 volt, 12 mamp for about 3 h until the front blue dye run out of the gel. After completion of the desired time of gel running, the gel was removed from the plate and stained with Coomasiae brilliant blue for overnight at 37°C. The stained gel was then washed several times with destaining solution. Protein concentration of different hours at 37 and 30°C were estimated by the Lowry method. All tubes were brought to 1 mL with water containing 100 μL of sample. Two tubes served as blank containing no protein. Five milliliter of assay mix was added to each tube and mixed by thoroughly vortexing. Tubes were then incubated at room temperature for exactly 10 min. After incubation, 0.5 mL of diluted Folin-Ciocalteu added and immediately vortex. After incubation at room temperature for 30 min absorbance was measured at 660 nm. Protein concentration of unknown samples was estimated by using the standard curve of BSA. Twenty larvae were placed in plastic cups containing 100 mL of distilled water. Thirty nangram of each Bti protein sample was added to each cup. 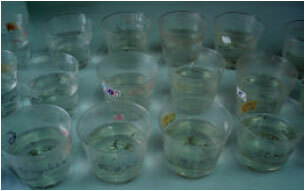 Similarly for the control experiment, five larvae were placed in plastic cup containing 100 mL distilled water only. The mortality data were recorded after 24 and 48 h of post treatment. The temperature of the test room was maintained 28±2°C. A preliminary bioassay test of the efficacy of crude and partially purified proteins have been conducted. Crude and partially purified proteins of 30 ng mL-1 have been used for the bioassay against the 4th instar mosquito larvae of Aedes aegypti. The results presented in Fig. 1a and b show that the crude proteins are effective against the 4th instar Aedes aegypti larvae. The bioassay test of the crude protein extracts of bacterium B. thuringiensis israelensis show that the protein is toxic to the larvae of Aedes aegypti mosquito. It has been observed that the heat-treated protein lost the mosquitocidal efficacy (Fig. 2). Combining the partial purification steps by heat denaturation process and the bioassay test against the larvae of Aedes aegypti reveal that heat-denaturation process cannot be used for the purification of Bti crystal proteins. It has been reported that synergistic interaction between the crystal components of Bti are required for high toxicity against the mosquito larvae (Angsuthanasombat et al., 1992; Chang et al., 1993; Delécluse et al., 1993; Poncet et al., 1994). Many other studies showed that Btis high toxicity is related to synergistic intractions among CytA and Cry proteins (Wu and Chang, 1985; Ibarra and Feerici, 1986; Crickmore et al., 1995). Federici et al. (2003) reported that the recombinant Bacillus sphaericus having Btis Cry4B is more toxic to Aedes aegypti than the transformants having Btis Cry11A. Both Cry4B and Cry11A proteins are very important for the toxicity against Aedes aegypti larvae. These studies showed that both Cry4B and Cry4A are very unstable even at 40°C and therefore synergistic interactions among the cry proteins with that of Cyt A which is required for high toxicity is probably hampered. These factors probably responsible for the total loss of mosquitocidal efficacy of the heat-treated partially purified proteins of Bti. The possibilities of the interaction of other proteins associated with the crystal proteins might be required for its mosquitocidal efficacy. This present experiment cannot exclude this possibility also. We thank professor Dr. Zagler, Ohio State University for giving the strain. Angsuthanasombat, C., N. Crickmore and D.J. Ellar, 1992. Comparison of Bacillus thuringiensis subsp. israelensis CryIVA and CryIVB cloned toxins reveals synergism in vivo. FEMS. Microbiol. Lett., 94: 63-68. Becker, N. and J. Margalit, 1993. Use of Bacillus thuringiensis israelensis Against Mosquitoes and Blackflies. In: Bacillus thuringiensis, an Environmentalbiopesticide: Theory and Practice, Entwistle, P.F., P.F. Cory, M.J. Bailey and S. Higgs (Eds.). John Wiley and Sons, Inc., New York. Chang, C., Y.M. Yu, S.M. Dai, S.K. Law and S.S. Gill, 1993. High-level cryIVD and cytA gene expression in Bacillus thuringiensis does not require the 20 kilodalton protein and the coexpressed gene products are synergistic in their toxicity to mosquitoes. Applied Environ. Microbiol., 59: 815-821. Crickmore, N., D.R. Zeigler, J. Feitelson, E. Schnepf and J. Van Rie et al., 1998. Revision of the nomenclature for the Bacillus thuringiensis pesticidal crystal proteins. Microbiol. Mol. Biol. Rev., 62: 807-813. Crickmore, N., E.J. Bone, J.A. Williams and D.J. Ellar, 1995. Contribution of the individual components of the -endotoxin crystal to the mosquitocidal activity of Bacillus thuringiensis subsp. israelensis. FEMS. Microbiol. Lett., 131: 249-254. Delécluse, A., S. Poncet, A. Klier and G. Rapoport, 1993. Expression of cryIVA and cryIVB genes, independently or in combination, in a crystal-negative strain of Bacillus thuringiensis subsp. israelensis. Applied Environ. Microbiol., 59: 3922-3927. Federici, B.A., H.W. Park, D.K. Bideshi, M.C. Wirth and J.J. Johnson, 2003. Review rcombinant bacteria for mosquito control. J. Exp. Biol., 206: 3877-3885. Hofte, H. and H.R. Whiteley, 1989. Insecticidal crystal proteins of Bacillus thuringiensis. Microbiol. Rev., 53: 242-255. Ibarra, J. and B.A. Feerici, 1986. Parasporal bodies of Bacillus thuringiensis subsp. morrisori (RG-14) Bacillus thuringiensis subsp. israelensis are similar in protein composition and toxicity. FEMS. Microbiol. Lett., 34: 79-84. Poncet, S., A. Delécluse, A. Klier and G. Rapoport, 1994. Evaluation of synergistic interactions between the CryIVA, CryIVB and CryIVD toxic components of Bacillus thuringiensis subsp. israelensis crystals. J. Invertebr. Pathol., 66: 131-135. Porter, A.G., 1996. Mosquitocidal toxins, genes and bacteria: The hit squad. Parasitol. Today, 12: 175-179. Porter, A.G., E.W. Davidson and J.W. Liu, 1993. Mosquitocidal toxins of Bacilli and their genetic manipulation for effective biological control of mosquitoes. Microbiol. Rev., 57: 838-861. Priest, F.G., 1992. Biological control of mosquitoes and other biting flies by Bacillus sphaericus and Bacillus thuringiensis. J. Applied Bacteriol., 72: 357-369. Schnepf, E., N. Crickmore, J. van Rie, D. Lereclus and J. Baum et al., 1998. Bacillus thuringiensis and its pesticidal crystal proteins. Microbiol. Mol. Biol. Rev., 62: 775-806. Van Frankenhuyzen, K., 1993. The Challenge of Bacillus thuringiensis. In: Bacillus thuringiensis, an Environmental Biopesticide: Theory and Practice, Entwistle, P.F., J.S. Cory, M.J. Bailey and S. Higgs (Eds.). John Wiley and Sons, Inc., New York, pp: 1-35. Wu, D. and F.N. Chang, 1985. Synergism in mosquitocidal activity of 26 and 65 kDa proteins from Bacillus thuringiensis subsp. 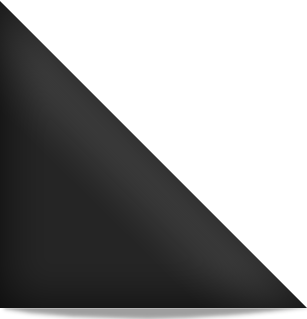 israelensis crystal. FEBS. Lett., 190: 232-236.